High-dose cyclophosphamide (Cy) and G-CSF are widely used to mobilize hemopoietic stem cells for treating patients with high-dose chemotherapy and autologous stem cell transplantation (ASCT). Because lymphocyte count in the graft collected after Cy-G-CSF treatment is an independent survival factor after ASCT for patients with multiple myeloma, our purpose was to study how Cy-G-CSF treatment affects the phenotype and function of T cells in patients with multiple myeloma. Cy induced a 3-fold decrease of T cell counts with a slow and partial T cell recovery of one-third at the time of hemopoietic stem cell collection. Cy-G-CSF treatment did not affect the relative ratios of central memory, effector memory, and late effector CD4+ or CD8+ T cells, but a decrease in the percentage of naive CD4+ cells was observed. The percentages of CD25+ cells increased 2- to 3-fold in CD4+ and CD8+ T cells, the former including both activated CD25low and CD25high cells. CD4+CD25high cells were regulatory T cells (Treg) that expressed high levels of FOXP3, CTLA-4, and GITR and displayed in vitro suppressive properties. The recovery of Treg absolute counts after Cy-G-CSF treatment was higher than the recovery of other lymphocyte subpopulations. In conclusion, Cy-G-CSF treatment induces a severe T cell count decrease without deleting Treg, which are potent inhibitors of antitumor response. The present data encourage novel therapeutic strategies to improve T cell recovery following ASCT while limiting Treg expansion. High-dose chemotherapy (HDC)3 associated with autologous stem cell transplantation (ASCT) improves the rate of complete remission and overall survival in patients with multiple myeloma (MM) and non-Hodgkin lymphoma at relapse (1, 2). Many studies have focused on the efficient mobilization of hemopoietic stem cells (HSC) by administration of hemopoietic growth factors with or without high-dose cyclophosphamide (Cy) (3, 4, 5, 6, 7, 8). Cy induces profound aplasia with the production of endogenous mediators and growth factors that favor hemopoietic recovery. These endogenous mediators and the administrated recombinant G-CSF stimulate HSC proliferation and their mobilization into the peripheral blood. This mobilization is attributable to the activation of bone marrow neutrophils by hemopoietic growth factors, in particular G-CSF, resulting in the production of enzymes that cleave adhesion molecules and chemokines and in the release of HSC from the bone marrow environment (9, 10). Because T lymphocytes are major actors in the graft-vs-host reaction in allogenic HSC transplantation, the characteristics of T lymphocytes collected by leukapheresis after HSC mobilization with G-CSF have been analyzed. Some studies indicate that G-CSF doubles the circulating T lymphocyte rate without major changes in the phenotype of T cells (11, 12). Several other studies (13, 14, 15) demonstrate that G-CSF might affect the cytotoxic T cell activity by inducing human lymphocytes to preferentially release type 2 cytokines (IL-4, IL-5, and IL-10) rather than type 1 (IFN-γ, TNF-α, and IL-2) upon activation. However, the phenotype and function of T lymphocytes mobilized with Cy and G-CSF have not been studied yet. This is important because Cy is a strong immunosuppressor. In mice, the Cy-induced immunosuppression is followed by a rapid T cell repopulation, likely associated with the production of endogenous T cell growth factors (16). In addition, a selective toxicity of Cy on regulatory T cells (Treg) has been demonstrated (17, 18, 19). Treg are CD4+CD25+ T cells that control key aspects of tolerance to self-Ags by suppressing activation of naive T cells, and they are crucial in the prevention of autoimmune diseases (20, 21). Treg express a specific transcription factor, FOXP3, which controls both their development and function (22). They also constitutively express some molecules associated with T cell activation including glucocorticoid-induced TNF receptor (GITR) and CTLA-4 (23, 24). Because a part of tumor-associated Ags is derived from self-Ags, Treg may be partially responsible for the lack of antitumor immune responses. In animal models, Treg expansion in the lymphoid organs of tumor-bearing animals is correlated with tumor volume, and the removal of Treg enhances antitumor immune responses. In humans, the proportion of Treg is increased in cancer patients. Thus, the depletion of Treg could be useful to promote an antitumor T cell response (20, 21). A recent study has emphasized that the number of infused autologous lymphocytes collected by Cy and hemopoietic growth factor mobilization was an independent factor for overall survival and time to progression post HDC and ASCT, in patients with MM (25). Given the lack of data regarding the phenotype and function of T lymphocytes in the HSC graft, the aim of our study was to characterize the behavior of T cell subpopulations after Cy-G-CSF treatment and, in particular, that of Treg. Human CD4+ or CD8+ T cells can be classified into naive T cells, central memory T cells, effector memory T cells, and late effector T cells (26, 27). During an immune reaction against a pathogen, naive T cells are primed by Ag-loaded dendritic cells (DCs) in lymphoid organs, proliferate widely, and differentiate into effector cells, which produce cytokines and are able to kill pathogens. After the acute activation phase, a fraction of the activated T lymphocytes persists as central memory T cells, able to induce a quick and strong immune response upon re-encountering Ag. Naive T cells express CD45RA and two lymph node homing receptors, CD62L, which enables T cells to adhere to endothelial cells, and CCR7, which is a receptor for the CCL19 and CCL21 lymph node chemokines. 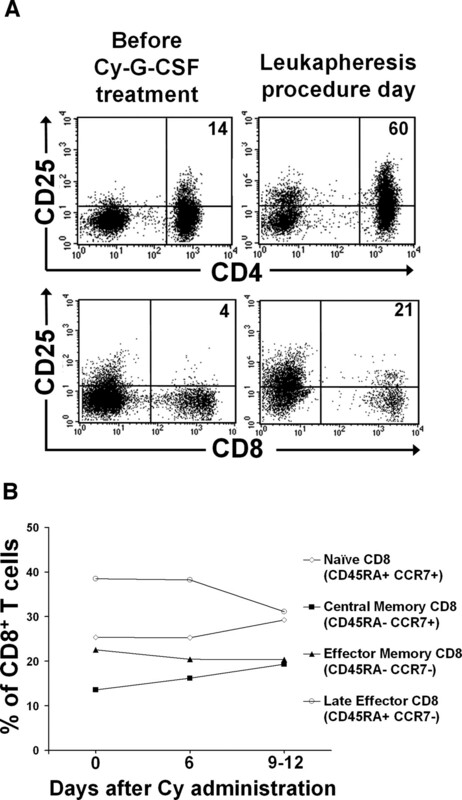 Central memory T cells are CD45RA− and express the chemokine receptors CCR7 and CD62L. Effector memory T cells are CD45RA− and lack CCR7 and CD62L but express receptors for inflammatory chemokines (CCR1, CCR3, and CCR5). Late effector T cells are CD45RA+CCR7− with a low expression of CD62L. In healthy individuals, there are very few circulating late effector CD45RA+CCR7−CD4+ T cells compared with the high proportion of late effector CD8+ T cells (28). We investigated in this study the phenotype and function of T lymphocytes present in the peripheral blood after high-dose Cy-induced aplasia and G-CSF mobilization in 14 patients with MM. Fourteen patients with MM (median age, 59 years) who underwent ASCT were included in this study, according to the French ethical laws. The series comprised nine male patients and five female patients. According to the Durie-Salmon classification, 10 patients had stage IIIA disease, two patients had stage IIIB, whereas one patient presented with a plasma cell leukemia, and one patient had a recurring plasmacytoma. One patient had IgAκ MM, one IgAλ MM, three IgGλ MM, eight IgGκ MM, and one Ig-nonsecreting plasmacytoma. The mobilization procedure consisted of a single 4-g/m2 Cy infusion followed by daily s.c. injections of 10 μg/kg/day G-CSF, until completion of HSC collection (≥6 × 106 CD34+ cells/kg) by leukapheresis. Blood samples were collected after written informed consent, on the day before Cy administration (day 0), 6 days after Cy administration (nadir), and on the day of the first leukapheresis procedure (median day 10; range, 9–12). PBMCs were obtained by density centrifugation using Ficoll-Hypaque (Cambrex BioScience). After written informed consent, 500 × 106 fresh cells from leukapheresis products were used for Treg sorting and functional assays. The phenotype of T cells was evaluated with the following mAbs: PE-conjugated anti-CD3, anti-CD4, anti-CD8β, anti-CD25, and anti-panγδTCR; FITC-conjugated anti-CD25, anti-CD4 and anti-CD8 (Beckman Coulter), and anti-CCR7 (R&D Systems); PE-Cy5-conjugated anti-CD45RA and anti-CTLA-4 (BD Biosciences Pharmingen); allophycocyanin-conjugated anti-GITR (BD Biosciences Pharmingen). The phenotype of NK cells was evaluated with a PE-conjugated anti-CD56 Ab (Beckman Coulter). Corresponding isotype-matched murine Abs, recognizing no human Ag, were used as negative controls. Briefly, appropriate amounts of Abs were added to 0.5 × 106 cells followed by a 30-min incubation at 4°C. RBC were then lysed, cells were washed, and 30 × 104 total events or 10 × 104 events in the lymphocyte gate were acquired on a FACSCalibur flow cytometer (BD Biosciences) or on a FACSAria cell sorter (BD Biosciences). Analyses were performed with the CellQuest software (BD Biosciences). Lymphocyte subsets were assessed by three-color immunofluorescence analysis. For determination of intracellular expression of CTLA-4, cells already stained for CD4 and CD25 were fixed for 20 min at 4°C with the Cytofix/Cytoperm kit (BD Pharmingen). Intracytoplasmic staining was then performed at 4°C in saponin-containing perm/wash buffer and in the presence of PE-Cy5-conjugated anti-CTLA-4 Ab. CD4+CD25high, CD4+CD25low, and CD4+CD25− T cells were purified from fresh PBMCs harvested before Cy-G-CSF treatment or from leukapheresis product. CD4+ T cells were first enriched by depletion of monocytes and B cells with anti-CD14 and anti-CD19 Abs-coated magnetic beads (Dynal Biotech). Then anti-CD25-PE and anti-CD4-FITC Abs were added, and CD4+CD25−, CD4+CD25low, and CD4+CD25high cells were sorted using a FACSAria cell sorter (BD Biosciences). The purity of the T cell subpopulations was >90%. Total RNA was prepared from sorted CD4+ subpopulations using the RNeasy Kit (Qiagen). cDNA was prepared from 1 μg of RNA using the Superscript II reverse transcriptase (Invitrogen Life Technologies) and oligo(dT)12–18 (Amersham Pharmacia Biotech) as primer. The relative levels of FOXP3, CTLA-4, or GITR mRNA in each subset were determined by real-time PCR on an ABI Prism 7000 Sequence Detector (Applied Biosystems) using the Assays-On-Demand products (Hs00203958_m1 for FOXP3 detection, Hs00175480_m1 for CTLA-4 detection, and Hs00188346_m1 for GITR detection) and the TaqMan Universal Master Mix. Quantitative PCR analysis was completed using ABI Prism 7000 SDS Software. Threshold cycle (Ct) values were measured for β2-microglobulin (β2m) and the genes of interest during the log phase of the cycle. The expression levels of genes of interest were normalized to that of β2m for each sample (δCt = Ct gene of interest, Ct β2m) and compared with the values obtained for a CD4+CD25high positive control isolated from a healthy donor, using the following formula: 100/2δδCt, where δδCt = δCt unknown − δCt positive control. Mature DCs were generated as detailed previously (29). Briefly, 8 × 106 G-CSF-mobilized leukapheresis cells were plated in 2 ml of X-VIVO15 medium (BioWhittaker) per well in six-well flat-bottom plates (Nunc). Nonadherent cells were discarded by gentle rinsing after a 2-h incubation at 37°C in 5% CO2. Adherent cells were cultured in X-VIVO15 medium with 2% human albumin, 100 ng/ml GM-CSF (Leukine; Berlex), and 25 ng/ml IL-4 (Cellgenix) for 5 days. DCs were then induced to mature for 24 h with 20 ng/ml TNF-α (Cellgenix) and 100 ng/ml PGE2 (PROSTIN E2; Pharmacia) and finally frozen in X-VIVO15–50% albumin-10% DMSO medium. In each well, 104 CD4+CD25− T cells, CD4+CD25low T cells, or CD4+CD25high T cells were seeded into 96-well U-bottom culture plates in a 200-μl final volume of RPMI 1640 (Invitrogen Life Technologies) supplemented with 5% human serum with or without 103 allogeneic mature DCs. Either 104 CD4+CD25high T cells or 104 CD4+CD25low T cells were added to wells containing DC-stimulated CD4+CD25− T cells. At the end of a 7-day culture, cells were pulsed with tritiated thymidine (Amersham Pharmacia Biotech) for 16 h, and tritiated thymidine incorporation was determined as reported previously (30). T cell and NK cell subpopulation profiles were studied for 14 patients. Mean white blood cell (WBC) count dropped on day 6 following Cy administration and then increased due to G-CSF injection (Fig. 1⇓A). The mean WBC count was 10 × 109/L on the day of the first leukapheresis procedure (median day 10; range, 9–12). G-CSF injections were stopped after HSC collection. Cy induced a 7-fold reduction of the CD3+ cell count on day 6 followed by a slow and partial recovery in all 14 patients (Fig. 1⇓B). The mean CD3+ cell count was 1.22 × 109/L before Cy-G-CSF treatment and dropped to 0.18 × 109/L 6 days after Cy injection, corresponding to the WBC count nadir. It then increased slightly to a mean count of 0.36 × 109/L on the first leukapheresis procedure day. The relative ratios of CD4+ and CD8+ cells within CD3+ cells were not significantly modified throughout the Cy-G-CSF-induced mobilization period (results not shown). NK cell counts paralleled the decrease of CD3+ cells with a one-fifth partial recovery on the first leukapheresis procedure day (Fig. 1⇓C). Thus, Cy administration induced a profound decrease of CD3 and NK cell counts. Leukocyte and CD3+ cell counts before and throughout Cy-G-CSF mobilization. The panel shows WBC counts (A), CD3+ cell counts (B), or NK cell (CD3−CD56+) counts (C) measured on the day before Cy administration (day 0), on day 6 after Cy administration (leukocyte nadir), and on the day of the first leukapheresis procedure (median day 10; range, 9–12) for the 14 patients with MM, treated with Cy and G-CSF. Data of individual patients are represented with specific symbol. Black horizontal lines denote mean values at each time point. ∗, Mean value is significantly different (p ≤ 0.05) from that before Cy administration, using the Student t test for pairs. ∗∗, Indicates that the mean value is significantly different (p ≤ 0.05) from that before Cy administration and from the nadir value at day 6, using the Student t test for pairs. We studied the subpopulations of naive CD4+ T cells (CD45RA+, CCR7+), central memory CD4+ T cells (CD45RA−, CCR7+), effector memory CD4+ T cells (CD45RA−CCR7−), and late effector CD4+ T cells (CD45RA+CCR7−) throughout the Cy-G-CSF mobilization period in 10 patients with MM. Given the large amount of data, only the mean percentages of CD4+ or CD8+ subsets are shown in Fig. 2⇓, A and B. Before Cy-G-CSF treatment, the mean percentages of the various subpopulations of CD4+ cells were as follows: naive CD4+ cells, 28% (range, 14–45%); central memory CD4+ cells, 47% (range, 35.7–65%); effector memory CD4+ cells, 21% (range, 12.7–31%); and late effector CD4+ cells, 5% (range, 0.1–16.3%) (Fig. 2⇓A). This profile of CD4+ cell subpopulation distribution did not differ from those previously reported for a healthy donor population (respectively, 28, 58, 12, and 2%) (31). We found that Cy-G-CSF treatment induced a slight but significant (p < 0.05) decrease in naive CD4+ cells relative rate (from 28 to 19%), whereas the percentages of the three subpopulations of memory CD4+ cell (central memory, effector memory, and late effector) were not significantly affected (Fig. 2⇓A). Before Cy-G-CSF treatment, CD8+ T cells comprised 25% (range, 12.3–49%) of naive cells, 14% (range, 6.7–27.5%) of central memory cells, 23% (range, 5.7–40%) of effector memory cells, and 38% (range, 18.6–64%) of late effector cells. The proportions of CD8+ subsets did not change significantly throughout Cy-G-CSF-induced HSC mobilization (Fig. 2⇓B) and did not differ from those previously reported in healthy donors (respectively, 30, 8, 30, and 32%) (32). Subpopulations of naive and memory CD4+ or CD8+ T cells before and throughout Cy-G-CSF mobilization. Results are the mean values of naive (CD45RA+, CCR7+), central memory (CD45RA−, CCR7+), effector memory (CD45RA−, CCR7−), and late effector (CD45RA+, CCR7−) CD4+ (A) or CD8+ (B) T cells determined at the time points described in Fig. 1⇑, for 10 patients with MM. ∗, Mean value is significantly different (p ≤ 0.05) from that before Cy administration, using the Student t test for pairs. Because SDs could be high due to interpatient variability, they were not shown. The proportions of CD4+ and CD8+ T cells that expressed CD25 increased throughout Cy-G-CSF mobilization. For one representative patient, a dot blot of CD25 labeling of CD4+ and CD8+ cells in the peripheral blood before mobilization and on the day of leukapheresis is shown in Fig. 3⇓A. The mean values of the 14 patients are shown in Fig. 3⇓B. A mean percentage of 46% of CD4+ T cells and of 13% of CD8+ T cells expressed CD25 on the day of the first leukapheresis procedure (median day 10, after Cy administration, range 9–12 days) (Fig. 3⇓B). These mean percentages were significantly increased 2.0- and 2.9-fold respectively, compared with those observed before Cy-G-CSF treatment (p ≤ 0.01). In humans, CD4+CD25+ cells contain both Treg that express high levels of CD25 (CD4+CD25high) and activated nonregulatory CD4+CD25low cells (33). These two populations could be found before but also after Cy-G-CSF treatment, suggesting that Treg are still present after Cy administration (Fig. 4⇓A). The mean percentages of both CD4+CD25high and CD4+CD25low subsets were increased 2-fold (p ≤ 0.01) at the time of HSC collection compared with those observed before Cy-G-CSF treatment (Fig. 4⇓, B and D). The mean CD4+CD25high and CD4+CD25low cell counts were decreased 5.6- and 3.6-fold, respectively (p ≤ 0.01), on day 6 after Cy administration. At the time of HSC collection, the mean CD4+CD25high and CD4+CD25low cell counts did not significantly differ from those prior Cy-G-CSF treatments, contrary to CD3+ cell or NK cell counts, which remained at least 3-fold decreased (Fig. 1⇑, B–C). Because these data are intriguing given the reported toxicity of Cy to Treg (17, 18, 34), the phenotype and function of CD4+CD25high cells in the leukapheresis product were studied in detail. CD4+CD25high, CD4+CD25low, and CD4+CD25− cells contained in the leukapheresis products from six patients with MM were purified using a FACSAria cell sorter (Fig. 5⇓A). FOXP3, CTLA-4, and GITR gene expressions were assayed using real-time RT-PCR. FOXP3 gene expression in CD4+CD25high cells was 60- to 200-fold higher than in CD4+CD25− (p < 0.001) cells and 6- to 20-fold higher than in CD4+CD25low cells (p < 0.01) (Fig. 5⇓B). CD4+CD25high, CD4+CD25low, and CD4+CD25− cells contained in the peripheral blood before mobilization from four patients with MM were also purified. A similar pattern of FOXP3 expression was found in the three purified subpopulations (data not shown). CD4+CD25high cells harvested before (data not shown) and on the day of leukapheresis (Fig. 5⇓, C and D) also overexpressed the CTLA-4 (p = 0.03) and GITR (p = 0.05) genes, other markers associated with Treg function. The expressions of CTLA-4 and GITR were confirmed at the protein level. As shown in Fig. 5⇓E for one representative patient of five patients with MM, CD4+CD25high cells were strongly labeled with anti-CTLA-4 Ab, unlike CD4+CD25− cells. CD4+CD25low cells displayed an intermediate CTLA-4 expression. CD4+CD25high cells collected on the day of leukapheresis also expressed higher levels of GITR than CD4+CD25low or CD4+CD25− cells. A similar high GITR and CTLA-4 protein expression by CD4+CD25high cells harvested before the mobilization was found for five patients with MM (data not shown). Percentages of CD25+ lymphocytes within CD4+ or CD8+ T cells. A, Representative dot plots showing CD25 expression in CD4+ and CD8+ cells before Cy administration and on the day of the first leukapheresis procedure. Peripheral blood cells were stained with anti-CD25-FITC and anti-CD4-PE or anti-CD8β-PE Abs. Control samples were stained with the corresponding IgG2a-FITC, IgG1-FITC, or IgG2a-PE isotype-matched 25 murine Ab. PBMCs were gated to include only small lymphocytes by forward and side scatter. Numbers on dot plots indicate the percentages of CD25+ cells calculated within CD4+ or CD8+ cells. B, Increased proportion of peripheral CD4+CD25+ and CD8+CD25+ T cells throughout the mobilization procedure in 14 patients. Results are mean values ± SD of percentages of CD25+ cells within CD4+ or CD8+ T cells for 14 patients with MM, determined before (day 0) and after Cy administration, at the time points described in Fig. 1⇑. ∗, Mean value is significantly different (p ≤ 0.05) from that before Cy administration, using the Student t test for pairs. CD25high and CD25low cells throughout Cy-G-CSF mobilization. A, Representative dot plots showing CD25 expression in CD4+ cells before Cy administration and on the day of the first leukapheresis procedure. Peripheral blood cells were stained with anti-CD25-FITC and anti-CD4-PE Abs. The corresponding IgG2a-PE isotype-matched murine Ab was used as a negative control. PBMCs were gated to include only small lymphocytes by forward and side scatter. CD4+ cells were designated CD25high if CD25 expression exceeded that seen in the CD4− population (which included CD8+ and NK cells). The percentages indicated are those calculated within CD4+ cells. B and D, Percentages of CD25high (B) and CD25low (D) cells within CD4+ T cells determined before (day 0) and throughout Cy-G-CSF mobilization, at the time points described in Fig. 1⇑, for 14 patients with MM. C and E, CD25high (C) and CD25low (E) cell counts determined before (day 0) and throughout Cy-G-CSF mobilization, at the time points described in Fig. 1⇑, for 14 patients with MM. Data of individual patients are represented with specific symbol. Black horizontal lines denote mean values at each time point. ∗, Indicates that the mean value is significantly different (p ≤ 0.01) from that before Cy administration (day 0), using the Student t test for pairs. ∗∗∗, Mean value is not different from that before Cy administration but is different (p ≤ 0.05) from the nadir value at day 6, using the Student t test for pairs. FOXP3, CTLA-4, and GITR are highly expressed by CD4+CD25high T cells. A, Purification of CD4+CD25high, CD4+CD25low, and CD4+CD25− subsets. Mononuclear cells were depleted of CD14+ cells with anti-CD14-coated magnetic beads and then stained with anti-CD25-PE and anti-CD4-FITC Abs. CD4+CD25high, CD4+CD25low, and CD4+CD25− cells were sorted using the indicated gates. The percentages on FACS plots indicate the purity of the sorted cells. Results are representative of 10 independent experiments. B–D, Relative FOXP3 (B), CTLA-4 (C), and GITR (D) expressions were measured by real-time RT-PCR in the three CD4+ subsets purified from leukapheresis products of six patients with MM. FOXP3, CTLA-4, and GITR expressions in each T cell subset were normalized with β2m expression and compared with FOXP3, CTLA-4, and GITR expressions in a healthy donor’s CD4+CD25high cells, which was assigned the arbitrary value of 100. Ct values were collected during the log phase of the cycle. p values are indicated when significant differences were detected using a Wilcoxon test. E, Leukapheresis cells were stained with anti-CD25-PE, anti-CD4-FITC, and anti-GITR-allophycocyanin or anti-CTLA-4-PE-Cy5 Abs. A representative case of five independent experiments is shown revealing that CD4+CD25high T cells express higher levels of intracellular CTLA-4 and surface GITR compared with that of CD4+CD25low or CD4+CD25− T cells. Numbers on FACS plots indicate the percentages of CTLA-4 or GITR-positive T cells among each population. To prove definitively that CD4+CD25high cells were Treg, we studied their ability to inhibit the activation of autologous CD4+CD25− cells by allogeneic DCs. CD4+CD25high cells harvested either before or after Cy administration abrogated activation of CD4+CD25− cells induced by allogeneic DCs, at 1:1 ratio of CD4+CD25− cells to Treg (Fig. 6⇓). CD4+CD25low cells were efficiently stimulated by DCs, contrary to CD4+CD25high cells, and were unable to inhibit activation of CD4+CD25− cells (Fig. 6⇓). Altogether, these data clearly demonstrate that circulating CD4+CD25high cells present during Cy-G-CSF mobilization are functional Treg, as are circulating CD4+CD25high cells harvested before Cy-G-CSF treatment, whereas the CD4+CD25low cells are activated non-Treg. CD4+CD25+ cells contain both CD4+CD25high Treg and CD4+CD25low activated non-Treg. CD4+ T cell subsets from leukapheresis product (A) or PBMCs harvested before Cy-G-CSF treatment (B) were purified as described in Fig. 5⇑. Ten thousand sorted CD4+CD25−, CD4+CD25low, or CD4+CD25high T cells were cultured in RPMI 1640–5% SAB medium alone or stimulated by 1 thousand thawed allogeneic DCs. When indicated, either 104 autologous CD4+CD25high T cells or 104 autologous CD4+CD25low T cells were added in wells containing DCs and CD4+CD25− cells. Cells were cultured for 7 days, and results are the mean value ± SD of tritiated incorporation determined in sixplicate culture wells. p values are indicated when significant differences were detected using a Wilcoxon test. Data are representative of three independent experiments. Table I⇓ depicts the cell composition of leukapheresis products of the 14 patients with MM. These products contained median values of 6.2 × 106 CD34+ cells/kg (range, 2.68–9.1), 21.1 × 106 CD3+ cells/kg (range, 13–116), including 15.8 × 106 CD4+ cells/kg and 6.3 × 106 CD8+ cells/kg, 3.8 × 106 NK cells/kg (range, 1.5–46.9) and 0.3 × 106 γδ T cells/kg (range, 0.1–5.3). They contained nearly 1 × 106 CD4+CD25high cells/kg (range, 0.4–5.1) with the phenotype and suppressive properties of Treg. The ratio of CD34+ cells to Treg ranged from 13.4 to 0.5 for a median value of 7. Mobilization regimens have been optimized to collect a maximum of CD34+ HSC to reduce aplasia and the number of leukaphereses. High-dose Cy associated with G-CSF is widely used because it results in a 2- to 3-fold increase in the number of CD34+ HSC collected per leukapheresis procedure compared with G-CSF alone (7, 8). However, very little attention has been given to the impact of Cy-G-CSF combination on the number, phenotype, and function of the T cells that are collected in the leukapheresis product and infused to the patient. In a cohort of 14 consecutive patients with MM, we show that Cy-G-CSF treatment induced a severe T cell and NK cell counts decrease. Circulating CD3+ cell counts were reduced 7-fold on day 6 after Cy administration and slowly and partially recovered, contrary to a rapid recovery of neutrophil and platelet counts. On the contrary, mobilization with G-CSF alone was shown to double circulating CD3+ cell counts (11, 12). Thus, although Cy increases the mobilization and collection of CD34+ cells, it dramatically reduces the number of circulating T cells. The effect of the mobilization regimen on T cell count might be of importance because Porrata et al. (25) have recently shown that absolute lymphocyte count in the autograft collected after Cy and hemopoietic growth factors treatment may affect survival in MM patients after ASCT. Patients receiving a high number of lymphocytes had higher response rates and lower relapse rates, resulting in improved survival. In particular, the autograft absolute lymphocyte count was an independent prognostic factor for overall survival and progression-free survival in MM patients (25). In this study, the lymphocyte population was not characterized and may include T cells, B cells, NK cells or, eventually, nonlymphocyte cells. T cells comprise several subsets with distinct phenotype and function. Based on CD45RA and CCR7 chemokine receptor expression, we investigated four CD4+ or CD8+ T cell subpopulations: naive T cells (CD45RA+, CCR7+), central memory T cells (CD45RA−, CCR7+), effector memory T cells (CD45RA−, CCR7−), and late effector T cells (CD45RA+, CCR7−). Before Cy-G-CSF treatment, the proportions of the four CD4+ subsets and the four CD8+ subsets in patients with MM were similar to those previously described in healthy individuals. They remained stable throughout the partial T cell recovery after Cy administration, except for a slight decrease in the naive CD4+ subset. 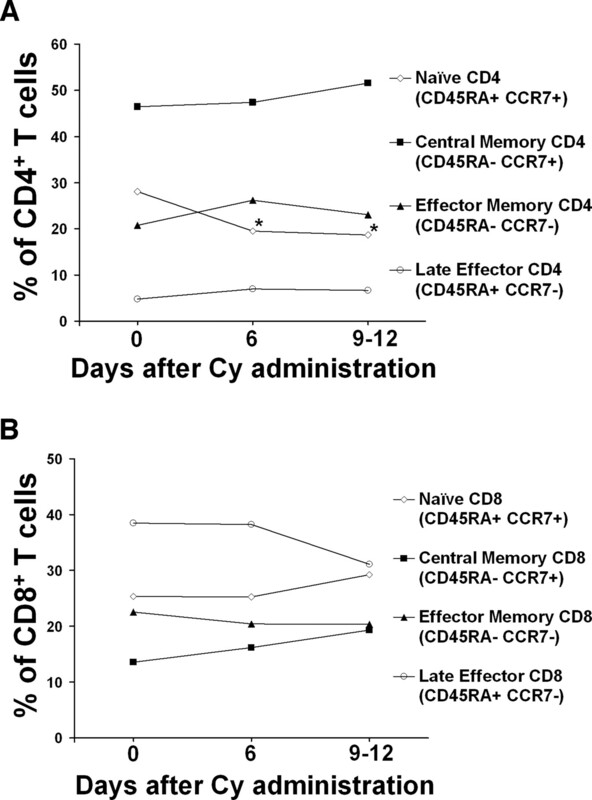 Thus, the current data indicate that the Cy-G-CSF mobilization regimen, while inducing a severe reduction in T cell count, did not significantly affect the proportions of memory and naive T cells. This is important considering that the memory T cell repertoire in the autograft is critical to T cell immunity reconstitution after HDC (35). We then investigated T cell activation. The percentages of CD25+ cells in CD4+ or CD8+ cells increased 2- or 3-fold throughout post-Cy lymphocyte recovery. In healthy individuals or patients with MM, CD4+CD25+ cells include Treg that highly express CD25 (CD4+CD25high cells) and activated nonregulatory CD4+ T cells (CD4+CD25low cells). The current study indicates that the percentages of both circulating subpopulations doubled during Cy-G-CSF mobilization. Concerning CD4+CD25low cells, such a high proportion of activated cells (40% of CD4+ cells) was not reported in studies that explored the phenotype of G-CSF mobilized T cells (12, 14, 36). This may be explained by an in vivo production of a cytokine burst able to activate T cells, which occurs after Cy treatment. In particular, Proietti et al. (16, 37) demonstrated in a murine model that one of these mediators was IFN-α. We demonstrated that CD4+CD25high cells collected in the leukapheresis product have the phenotype of Treg. They highly express the FOXP3, CTLA-4, and GITR genes and the CTLA-4 and GITR proteins compared with CD4+CD25low or CD4+CD25− cells. FOXP3 is one of the best Treg-specific markers available to date (22). CTLA-4 is usually up-regulated on T cells after activation. It has been shown to be constitutively expressed by Treg and is involved in their suppressive function (24). GITR, a member of the TNF receptor superfamily, is a costimulatory molecule overexpressed on Treg but also found on activated T cells. Activation of GITR may abrogate Treg suppressive function (23, 38). We also demonstrated that CD4+CD25high cells collected in the leukapheresis product strongly suppress the proliferation of autologous CD4+CD25− cells induced by allogeneic DCs, unlike CD4+CD25low cells. Thus, CD4+CD25+ cells in the leukapheresis product contain both activated lymphocytes and functional Treg, and the frequency of Treg in CD4+ cells is doubled at the time of HSC collection compared with pre-Cy-GSF treatment. This observation is noteworthy because low doses of Cy have a specific toxicity to Treg in rodents, leading to Treg apoptosis and loss of function (17, 18, 19, 34, 39). In particular, Ghiringhelli et al. (18) demonstrated that a single injection of a low dose of Cy in tumor-bearing rats abrogated the rise of Treg that generally occurred during tumor progression, resulting in the restoration of an antitumor immune response. More recently, Lutsiak et al. (34) demonstrated that in addition to decreasing the Treg cell number, a low dose of Cy inhibits the suppressive capability of Treg in mice. The fact that Treg are still present and fully functional after mobilization with high-dose Cy and G-CSF could be assigned to G-CSF because it increases the number of circulating Treg in healthy individuals (40). Furthermore, Hadaya et al. (41) have demonstrated that G-CSF treatment prevents Cy acceleration of autoimmune diabetes in NOD mice by stimulating the expansion of regulatory CD4+CD25+CD62Lhigh T cells. It has also been reported in a NOD mouse model that G-CSF injection promotes the splenic accumulation of plasmacytoid tolerogenic DCs, which have the property to expand Treg (42). Our data indicate that the median Treg count in leukaphereses is approximately one-seventh that of CD34+ cells. Because >3 × 106/kg CD34+ cells are generally grafted to patients, >4 × 105/kg Treg are also grafted. These Treg could contribute to hindering the reconstitution of T cells after HDC. In particular, given the well-documented suppressive activity of Treg on antitumor T cells (43, 44, 45), these grafted Treg could affect the emergence of antimyeloma T cells after HDC. In this small series of 14 patients with MM, we found no relationship between the grafted Treg counts and the response rate to HDC, and the follow-up of these patients is as yet too short to evaluate a link between Treg count and event-free or overall survival. Our study points out the interest to monitor grafted T cell subsets and Treg counts on a large series of patients to look for their impact on response, event-free and overall survival rates. The present data could be useful to improve the treatment of patients with MM using high-dose melphalan supported by ASCT. Indeed high-dose melphalan induces a profound and long-lasting T cell immunosuppression (46). Because we show in this study that the grafted T cells comprise activated T cells, one can suggest that these patients could be provided with T cell growth factors to favor T cell recovery and growth. According to the recent data indicating that grafted lymphocyte counts could predict survival in patients with MM (25), this may dramatically improve treatment response. IL-2 would have a limited interest because 1) systemic IL-2 administration induces severe toxicity, 2) IL-2 is necessary to the homeostatic maintenance of the pool of natural Treg (47), and 3) IL-2 is required to expand Treg in vitro and to induce their suppressive properties (48). IL-7 or IL-15 could be more promising in a posttransplant setting. Indeed, these two cytokines have reduced systemic toxicities compared with IL-2 injections (49), and they are able to abrogate the suppressive activity of Treg (50). An alternative strategy would be to inject IL-7 and/or IL-15 in patients throughout the Cy-G-CSF-induced mobilization to speed up T cell recovery in vivo and to collect high T cell numbers through apheresis. A third possibility would be to deplete CD25high Treg and then amplify collected T cells with anti-CD3 and anti-CD28-coated microbeads ex vivo to prepare large numbers of T cells that could be grafted after HDC (51). In particular, Powell et al. (52) successfully depleted Treg from leukapheresis products using a clinical-grade large-scale immunomagnetic system. Mobilization regimens to collect HSC in patients with MM are heterogeneous, including Cy and G-CSF, G-CSF alone, cytokine combination (stem cell factor and G-CSF or erythropoietin and G-CSF) (53, 54, 55), or the novel AMD3100 CXCR4 inhibitor (56). Only the ability to mobilize the CD34+ progenitors and the collection of CD34+ cells in leukapheresis are generally considered. Our study indicates that the mobilization regimens should also be compared for their ability to affect the number and function of T cells that can be collected and grafted to patients. C. Duperray and G. Requirand performed the cell sorting, and L. Nadal provided technical assistance. ↵1 This work was supported by grants from the Ligue Nationale Contre Le Cancer (Équipe Labellisée), Paris, France. M.C. was supported by grants from La Fondation pour la Recherche Médicale, Paris, France. ↵3 Abbreviations used in this paper: HDC, high-dose chemotherapy; ASCT, autologous stem cell transplantation; MM, multiple myeloma; HSC, hemopoietic stem cell; Cy, cyclophosphamide; Treg, regulatory T cell; GITR, glucocorticoid-induced TNF receptor; DC, dendritic cell; Ct, threshold cycle; WBC, white blood cell. Philip, T., C. Guglielmi, A. Hagenbeek, R. Somers, H. Van der Lelie, D. Bron, P. Sonneveld, C. Gisselbrecht, J. Y. Cahn, J. L. Harousseau, et al 1995. Autologous bone marrow transplantation as compared with salvage chemotherapy in relapses of chemotherapy-sensitive non-Hodgkin’s lymphoma. N. Engl. J. Med. 333: 1540-1545. Attal, M., J. L. Harousseau, A. M. Stoppa, J. J. Sotto, J. G. Fuzibet, J. F. Rossi, P. Casassus, H. Maisonneuve, T. Facon, N. Ifrah, et al 1996. A prospective, randomized trial of autologous bone marrow transplantation and chemotherapy in multiple myeloma: Intergroupe Francais du Myelome. N. Engl. J. Med. 335: 91-97. Gianni, A. M., S. Siena, M. Bregni, C. Tarella, A. C. Stern, A. Pileri, G. Bonadonna. 1989. Granulocyte-macrophage colony-stimulating factor to harvest circulating haemopoietic stem cells for autotransplantation. Lancet 2: 580-585. Desikan, K. R., B. Barlogie, S. Jagannath, D. H. Vesole, D. Siegel, A. Fassas, N. Munshi, S. Singhal, J. Mehta, S. Tindle, et al 1998. Comparable engraftment kinetics following peripheral-blood stem-cell infusion mobilized with granulocyte colony-stimulating factor with or without cyclophosphamide in multiple myeloma. J. Clin. Oncol. 16: 1547-1553. To, L. B., K. M. Shepperd, D. N. Haylock, P. G. Dyson, P. Charles, D. L. Thorp, B. M. Dale, G. W. Dart, M. M. Roberts, R. E. Sage, et al 1990. Single high doses of cyclophosphamide enable the collection of high numbers of hemopoietic stem cells from the peripheral blood. Exp. Hematol. 18: 442-447. Winter, J. N., H. M. Lazarus, A. Rademaker, M. Villa, C. Mangan, M. Tallman, L. Jahnke, L. Gordon, S. Newman, K. Byrd, et al 1996. Phase I/II study of combined granulocyte colony-stimulating factor and granulocyte-macrophage colony-stimulating factor administration for the mobilization of hematopoietic progenitor cells. J. Clin. Oncol. 14: 277-286. Narayanasami, U., R. Kanteti, J. Morelli, A. Klekar, A. Al-Olama, C. Keating, C. O’Connor, E. Berkman, J. K. Erban, K. A. Sprague, et al 2001. Randomized trial of filgrastim versus chemotherapy and filgrastim mobilization of hematopoietic progenitor cells for rescue in autologous transplantation. Blood 98: 2059-2064. Koc, O. N., S. L. Gerson, B. W. Cooper, M. Laughlin, H. Meyerson, L. Kutteh, R. M. Fox, E. M. Szekely, N. Tainer, H. M. Lazarus. 2000. Randomized cross-over trial of progenitor-cell mobilization: high-dose cyclophosphamide plus granulocyte colony-stimulating factor (G-CSF) versus granulocyte-macrophage colony-stimulating factor plus G-CSF. J. Clin. Oncol. 18: 1824-1830. Levesque, J. P., Y. Takamatsu, S. K. Nilsson, D. N. Haylock, P. J. Simmons. 2001. Vascular cell adhesion molecule-1 (CD106) is cleaved by neutrophil proteases in the bone marrow following hematopoietic progenitor cell mobilization by granulocyte colony-stimulating factor. Blood 98: 1289-1297. Levesque, J. P., J. Hendy, Y. Takamatsu, B. Williams, I. G. Winkler, P. J. Simmons. 2002. Mobilization by either cyclophosphamide or granulocyte colony-stimulating factor transforms the bone marrow into a highly proteolytic environment. Exp. Hematol. 30: 440-449. Theilgaard-Monch, K., K. Raaschou-Jensen, H. Palm, K. Schjodt, C. Heilmann, L. Vindelov, N. Jacobsen, E. Dickmeiss. 2001. Flow cytometric assessment of lymphocyte subsets, lymphoid progenitors, and hematopoietic stem cells in allogeneic stem cell grafts. Bone Marrow Transplant. 28: 1073-1082. Tayebi, H., F. Kuttler, P. Saas, A. Lienard, B. Petracca, V. Lapierre, C. Ferrand, T. Fest, J. Cahn, D. Blaise, et al 2001. Effect of granulocyte colony-stimulating factor mobilization on phenotypical and functional properties of immune cells. Exp. Hematol. 29: 458-470. Rutella, S., L. Pierelli, G. Bonanno, S. Sica, F. Ameglio, E. Capoluongo, A. Mariotti, G. Scambia, G. d’Onofrio, G. Leone. 2002. Role for granulocyte colony-stimulating factor in the generation of human T regulatory type 1 cells. Blood 100: 2562-2571. Singh, R. K., M. L. Varney, K. Ino, J. M. Vose, P. J. Bierman, J. E. Talmadge. 2000. Immune dysfunction despite high levels of immunoregulatory cytokine gene expression in autologous peripheral blood stem cell transplanted non-Hodgkin’s lymphoma patients. Exp. Hematol. 28: 499-507. Sloand, E. M., S. Kim, J. P. Maciejewski, F. Van Rhee, A. Chaudhuri, J. Barrett, N. S. Young. 2000. Pharmacologic doses of granulocyte colony-stimulating factor affect cytokine production by lymphocytes in vitro and in vivo. Blood 95: 2269-2274. Schiavoni, G., F. Mattei, T. Di Pucchio, S. M. Santini, L. Bracci, F. Belardelli, E. Proietti. 2000. Cyclophosphamide induces type I interferon and augments the number of CD44hi T lymphocytes in mice: implications for strategies of chemoimmunotherapy of cancer. Blood 95: 2024-2030. Awwad, M., R. J. North. 1988. Cyclophosphamide (Cy)-facilitated adoptive immunotherapy of a Cy-resistant tumour: evidence that Cy permits the expression of adoptive T-cell mediated immunity by removing suppressor T cells rather than by reducing tumour burden. Immunology 65: 87-92. Ghiringhelli, F., N. Larmonier, E. Schmitt, A. Parcellier, D. Cathelin, C. Garrido, B. Chauffert, E. Solary, B. Bonnotte, F. Martin. 2004. CD4+CD25+ regulatory T cells suppress tumor immunity but are sensitive to cyclophosphamide which allows immunotherapy of established tumors to be curative. Eur. J. Immunol. 34: 336-344. O’Garra, A., P. Vieira. 2004. Regulatory T cells and mechanisms of immune system control. Nat. Med. 10: 801-805. Piccirillo, C. A., A. M. Thornton. 2004. Cornerstone of peripheral tolerance: naturally occurring CD4+CD25+ regulatory T cells. Trends Immunol. 25: 374-380. Yagi, H., T. Nomura, K. Nakamura, S. Yamazaki, T. Kitawaki, S. Hori, M. Maeda, M. Onodera, T. Uchiyama, S. Fujii, S. Sakaguchi. 2004. Crucial role of FOXP3 in the development and function of human CD25+CD4+ regulatory T cells. Int. Immunol. 16: 1643-1656. Birebent, B., R. Lorho, H. Lechartier, S. de Guibert, M. Alizadeh, N. Vu, A. Beauplet, N. Robillard, G. Semana. 2004. 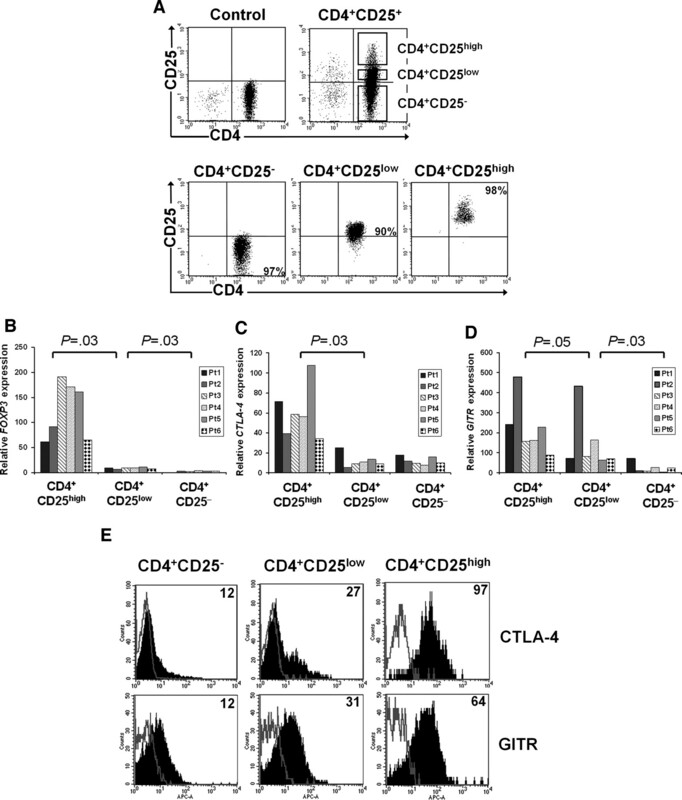 Suppressive properties of human CD4+CD25+ regulatory T cells are dependent on CTLA-4 expression. Eur. J. Immunol. 34: 3485-3496. Porrata, L. F., M. A. Gertz, S. M. Geyer, M. R. Litzow, D. A. Gastineau, S. B. Moore, A. A. Pineda, K. L. Bundy, D. J. Padley, D. Persky, et al 2004. The dose of infused lymphocytes in the autograft directly correlates with clinical outcome after autologous peripheral blood hematopoietic stem cell transplantation in multiple myeloma. Leukemia 18: 1085-1092. Tarte, K., G. Fiol, J. F. Rossi, B. Klein. 2000. Extensive characterization of dendritic cells generated in serum-free conditions: regulation of soluble antigen uptake, apoptotic tumor cell phagocytosis, chemotaxis and T cell activation during maturation in vitro. Leukemia 14: 2182-2192. Jourdan, M., X. G. Zhang, M. Portier, J. M. Boiron, R. Bataille, B. Klein. 1991. IFN-α induces autocrine production of IL-6 in myeloma cell lines. J. Immunol. 147: 4402-4407. Alexander, T. H., G. M. Ortiz, M. F. Wellons, A. Allen, E. J. Grace, 2nd, B. Schweighardt, J. Brancato, J. K. Sandberg, S. N. Furlan, G. D. Miralles, et al 2003. Changes in CD4+ T-cell differentiation phenotype during structured treatment interruption in patients with chronic HIV-1 infection. J. Acquir. Immune Defic. Syndr. 34: 475-481. Rufer, N., A. Zippelius, P. Batard, M. J. Pittet, I. Kurth, P. Corthesy, J. C. Cerottini, S. Leyvraz, E. Roosnek, M. Nabholz, P. Romero. 2003. Ex vivo characterization of human CD8+ T subsets with distinct replicative history and partial effector functions. Blood 102: 1779-1787. Lutsiak, M. E., R. T. Semnani, R. De Pascalis, S. V. Kashmiri, J. Schlom, H. Sabzevari. 2005. Inhibition of CD4+25+ T regulatory cell function implicated in enhanced immune response by low-dose cyclophosphamide. Blood 105: 2862-2868. Mackall, C. L., R. E. Gress. 1997. Pathways of T-cell regeneration in mice and humans: implications for bone marrow transplantation and immunotherapy. Immunol. Rev. 157: 61-72. Joshi, S. S., J. C. Lynch, S. Z. Pavletic, S. R. Tarantolo, S. J. Pirruccello, A. Kessinger, M. R. Bishop. 2001. Decreased immune functions of blood cells following mobilization with granulocyte colony-stimulating factor: association with donor characteristics. Blood 98: 1963-1970. Proietti, E., G. Greco, B. Garrone, S. Baccarini, C. Mauri, M. Venditti, D. Carlei, F. Belardelli. 1998. Importance of cyclophosphamide-induced bystander effect on T cells for a successful tumor eradication in response to adoptive immunotherapy in mice. J. Clin. Invest. 101: 429-441. Ercolini, A. M., B. H. Ladle, E. A. Manning, L. W. Pfannenstiel, T. D. Armstrong, J. P. Machiels, J. G. Bieler, L. A. Emens, R. T. Reilly, E. M. Jaffee. 2005. Recruitment of latent pools of high-avidity CD8+ T cells to the antitumor immune response. J. Exp. Med. 201: 1591-1602. Vela-Ojeda, J., M. A. Esparza, E. Reyes-Maldonado, L. Jimenez-Zamudio, E. Garcia-Latorre, M. Moreno-Lafont, I. Estrada-Garcia, H. Mayani, L. Montiel-Cervantes, F. Tripp-Villanueva, et al 2005. CD4+CD25+ lymphocyte and dendritic cell mobilization with intermediate doses of recombinant human granulocyte colony-stimulating factor in healthy donors. Stem Cells Dev. 14: 310-316. Hadaya, K., H. Kared, A. Masson, L. Chatenoud, F. Zavala. 2005. G-CSF treatment prevents cyclophosphamide acceleration of autoimmune diabetes in the NOD mouse. J. Autoimmun. 24: 125-134. Kared, H., A. Masson, H. Adle-Biassette, J. F. Bach, L. Chatenoud, F. Zavala. 2005. Treatment with granulocyte colony-stimulating factor prevents diabetes in NOD mice by recruiting plasmacytoid dendritic cells and functional CD4+CD25+ regulatory T-cells. Diabetes 54: 78-84. Wang, H. Y., D. A. Lee, G. Peng, Z. Guo, Y. Li, Y. Kiniwa, E. M. Shevach, R. F. Wang. 2004. Tumor-specific human CD4+ regulatory T cells and their ligands: implications for immunotherapy. Immunity 20: 107-118. Nishikawa, H., E. Jager, G. Ritter, L. J. Old, S. Gnjatic. 2005. CD4+CD25+ regulatory T cells control the induction of antigen-specific CD4+ helper T cell responses in cancer patients. Blood 106: 1008-1011. Guillaume, T., D. B. Rubinstein, M. Symann. 1998. Immune reconstitution and immunotherapy after autologous hematopoietic stem cell transplantation. Blood 92: 1471-1490. Setoguchi, R., S. Hori, T. Takahashi, S. Sakaguchi. 2005. Homeostatic maintenance of natural Foxp3+ CD25+CD4+ regulatory T cells by interleukin (IL)-2 and induction of autoimmune disease by IL-2 neutralization. J. Exp. Med. 201: 723-735. Antony, P. A., N. P. Restifo. 2005. CD4+CD25+ T regulatory cells, immunotherapy of cancer, and interleukin-2. J. Immunother. 28: 120-128. Alpdogan, O., M. R. van den Brink. 2005. IL-7 and IL-15: therapeutic cytokines for immunodeficiency. Trends Immunol. 26: 56-64. Ruprecht, C. R., M. Gattorno, F. Ferlito, A. Gregorio, A. Martini, A. Lanzavecchia, F. Sallusto. 2005. Coexpression of CD25 and CD27 identifies FoxP3+ regulatory T cells in inflamed synovia. J. Exp. Med. 201: 1793-1803. Trickett, A., Y. L. Kwan. 2003. T cell stimulation and expansion using anti-CD3/CD28 beads. J. Immunol. Methods. 275: 251-255. Powell, D. J., Jr, L. L. Parker, S. A. Rosenberg. 2005. 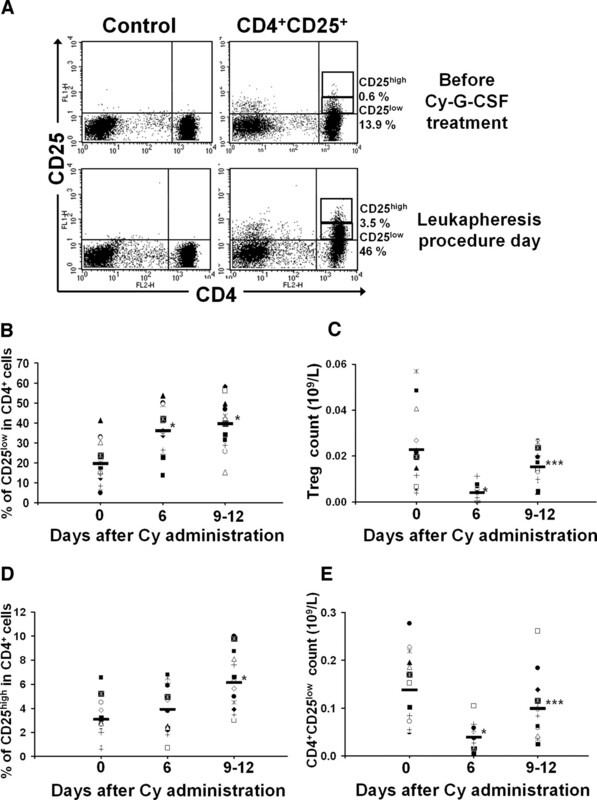 Large-scale depletion of CD25+ regulatory T cells from patient leukapheresis samples. J. Immunother. 28: 403-411. Shpall, E. J.. 1999. The utilization of cytokines in stem cell mobilization strategies. Bone Marrow Transplant. 23: (Suppl. 2):S13-S19. Facon, T., J. L. Harousseau, F. Maloisel, M. Attal, J. Odriozola, A. Alegre, W. Schroyens, C. Hulin, R. Schots, P. Marin, et al 1999. Stem cell factor in combination with filgrastim after chemotherapy improves peripheral blood progenitor cell yield and reduces apheresis requirements in multiple myeloma patients: a randomized, controlled trial. Blood 94: 1218-1225. Devine, S. M., N. Flomenberg, D. H. Vesole, J. Liesveld, D. Weisdorf, K. Badel, G. Calandra, J. F. DiPersio. 2004. Rapid mobilization of CD34+ cells following administration of the CXCR4 antagonist AMD3100 to patients with multiple myeloma and non-Hodgkin’s lymphoma. J. Clin. Oncol. 22: 1095-1102.